The Student Scout and Guide Organisation (SSAGO) is a non-uniformed organisation that enables students to continue or begin their Scouting or Guiding journey whilst at college or university. As a national organisation we have clubs at over 40 universities and colleges across the United Kingdom. SSAGO clubs generally meet at least once a week with activities being broadly classified into three categories: adventure, social and community. SSAGO also provides a link to local Scouting and Guiding to enable members to continue or begin working within their section whilst at university. With over 50 active members, we at Southampton SSAGO are the largest club in the country. We put on a broad programme of weekly activities, from cake decorating (which we have been known to sell on SUSU premises) to trampolining. Being the biggest club, we take large numbers to all national events – including camping events called Rallies and also the annual SSAGO Ball – where we are able to proudly promote the University of Southampton. In June 2016, Southampton SSAGO will host one of the biggest SSAGO events of the year –Summer Rally! We will be welcoming around 100-250 SSAGO members from across the country to a local campsite, Butcher’s Coppice, where we will put on a fun weekend of activities, socialising and exploring of the Southampton area. The whole camp will have a fun Dinosaur theme! There are a range of cultural and social activities available in Southampton and the surrounding area, and we hope to offer our participants a broad activity programme. Members of the University of Southampton will be helping to run and taking part in these activities.Our planned programme includes trips to the New Forest, a day-out at the nearby Brownsea Island, an afternoon at a water park, plus a cycling trip. In order for our Southampton members to offer this range of activities, we will require several minibuses to transport our participants around Hampshire and Dorset. Though each Rally participant pays £25 upon booking, much of this goes towards camping fees and food costs. We as a committee would like to add to our budget through fundraising, in order provide travel for the broad range of activities that we have planned. 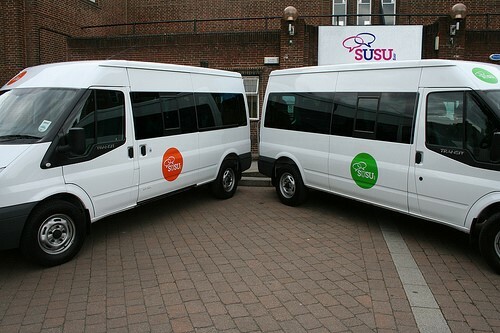 Each minibus from the Students' Union costs £160 to hire for a weekend. It is possible that we may need as many as five, and any help funding these buses would be greatly appreciated. On top of transport costs, funds raised would help go towards other large expenses for the event such as hiring a Ceilidh band - local bands charge around £400-£550 for one evening. We believe that by offering an array of activities, in locations ranging from Southampton to the Bournemouth area, then this would strike much enthusiasm in our travelling participants. Not only that, but it would enhance the opportunities of Southampton members by allowing them to run and take part in a diverse range of activities. By showing the hundreds of SSAGO members what is on offer in and around Southampton, then we will be helping improve the provision of activities in the area. All in all, we expect it to be a fantastic weekend and the more support we can get, then the better an event we Southampton students can put on for our Scouting and Guiding friends from across the country. Thank you so much for any support you can provide! Check out our website to keep up to date with our event! Receive a limited edition Southampton Dino Rally badge! Receive a wonderful Southampton Dino Rally T-shirt, being made specially for the event. Fund a whole minibus and we will grant you a VIP invitation to the event! Come and see what goes on at a SSAGO Rally, and take part in some activities if you so wish! Not only that, but our publicity materials such as the national SSAGO website will pay tribute to you, thanking you for your generosity.